Children today would find it hard to believe that cartoons were NOT always available for viewing 24/7. It is enough to make you say Good Grief! Saturday morning cartoons and holiday specials were the norm for those of us of a certain age. Charlie Brown and the Great Exhibit is the latest temporary exhibit at MSI, celebrating the 50-year legacy of Charles Schulz and his Peanuts gang. Through original cartoons, memorabilia and fun activities for the family, guests will relive Peanuts’ unique brand of wit and wisdom; discover how characters like Charlie Brown, Snoopy, and Linus developed over decades in popular culture; and even learn how to create their own animation. Charles Schulz revolutionized the comic strip and greatly affected cartoon history with his Peanuts characters. From appearing in just seven papers in 1950, Peanuts grew to be published in more than 2,600 newspapers in 75 countries with more than 355 million readers. 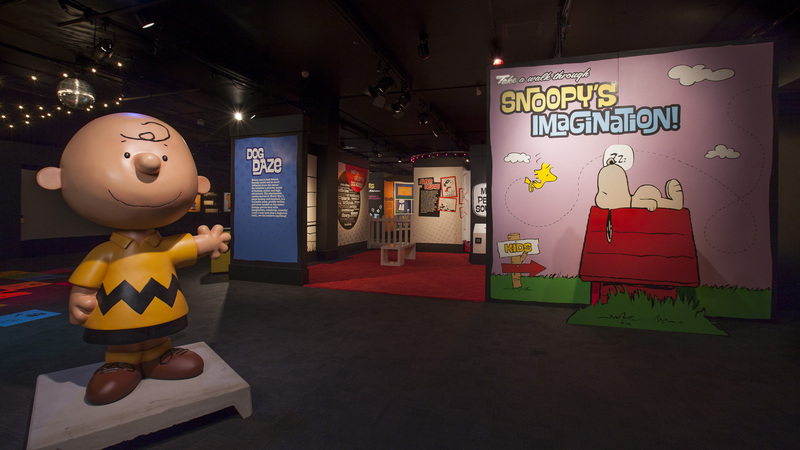 This exhibit is a nostalgic one for adults and a fun introduction to cartooning and the Peanuts characters for the younger children. In the spirit of Linus- teach your children a new vocabulary word- zoetrope. Through the arts they can draw their own static images to apply the science of the zoetrope to create animation. Inside Snoopy's Doghouse - Dress as one of Snoopy’s well-known personalities, like Joe Cool or the Flying Ace; personalize Snoopy’s novel’s perpetual opening line, “It was a dark and stormy night…” by adding prose of your own; and trigger famous sounds from Snoopy and the Peanuts gang! Schroeder's Piano - Tap out a tune with your feet on this oversized grand piano. Perhaps you'll inspire someone else to take to the dance floor, where Snoopy's footprints show his signature moves beneath the disco ball. Color the Gang with Digital Crayon - Take Peanuts to the digital age in this fun, high-tech interactive. Use the touch screen to choose colors, then with a digital “crayon” you can fill in an image of the Peanuts gang projected on a giant screen. The Peanut Gallery - Create your own animation and have it brought to life in a zoetrope, a spinning cylinder that weaves a series of static images into the illusion of a single animation. Costume a Character - Dress up your favorite Peanuts characters hanging on a magnetic wall with seasonal clothing and accessories. Fifty Year of Peanuts - Touchscreen displays allow you to browse through a virtual library of Peanuts compilation books. Touch a book cover on the virtual bookshelf, and start flipping through to find your favorite era and strips. For more info and to purchase tickets visit the museum's website. This exhibit requires an additional timed ticket. Upcoming free days for Illinois residents can be found on the website. There are several in January. For the month of December, it is Dec. 3. Please check the website to confirm. You may want to combine your trip to see Charlie Brown with a visit to view the international Christmas trees. One tip - you might want to take a family picture by the Charlie Brown tree inside the exhibit. We did. There is a large version of the famous tree - you know the one- "it's not such a bad little tree" - that would make a great holiday card.